IN October 2017, my editor Chris Harris showed my father, Brian Walker, around Dunedin, one of New Zealand’s most long-established cities. 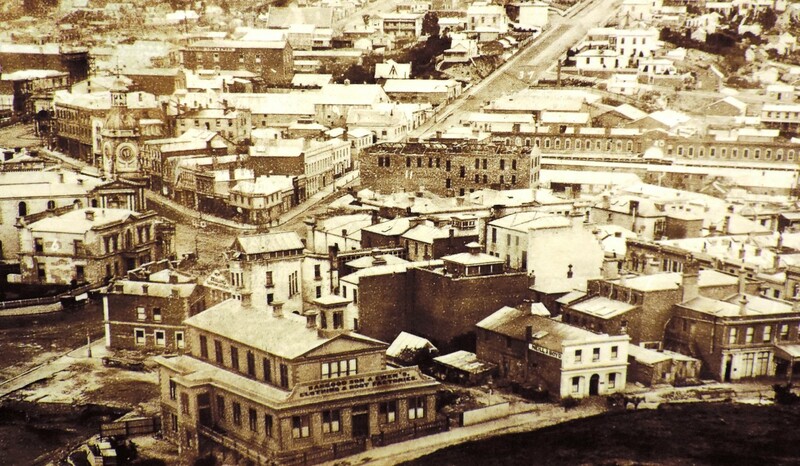 Here’s part of a panorama of 1870s Dunedin, on display at the Toitū Otago Settlers Museum. The Maori word Toitū, meaning undisturbed or uncut, also connotes museum and so this is a bilingual name. Otago is the name of the wider region in which Dunedin is located. Detail from 1870s panorama in the Toitū Otago Settlers Museum. The uncompleted building in the middle is the Garrison Hall in Dowling Street. Dunedin is a planned city, founded in 1848 as an ideal metropolis for future settlers, who were mainly expected to come from Scotland. 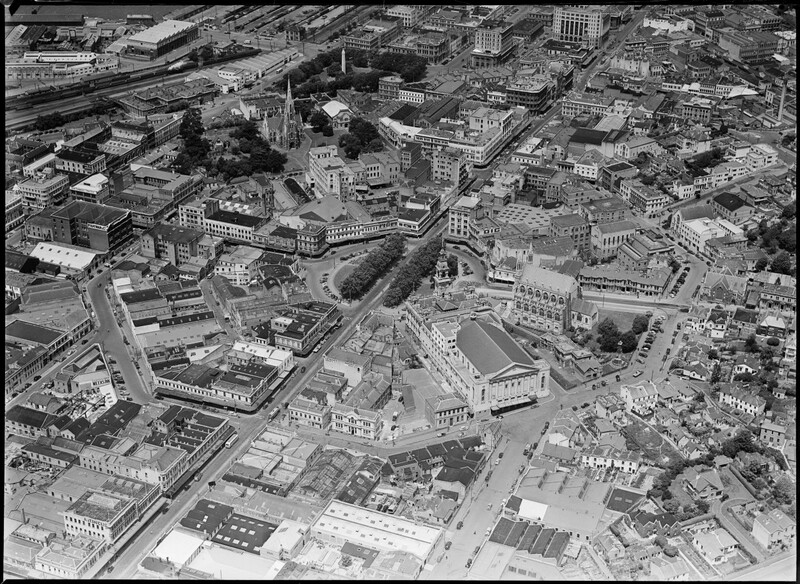 Christchurch, further north, was more ‘English’, and also a planned city. 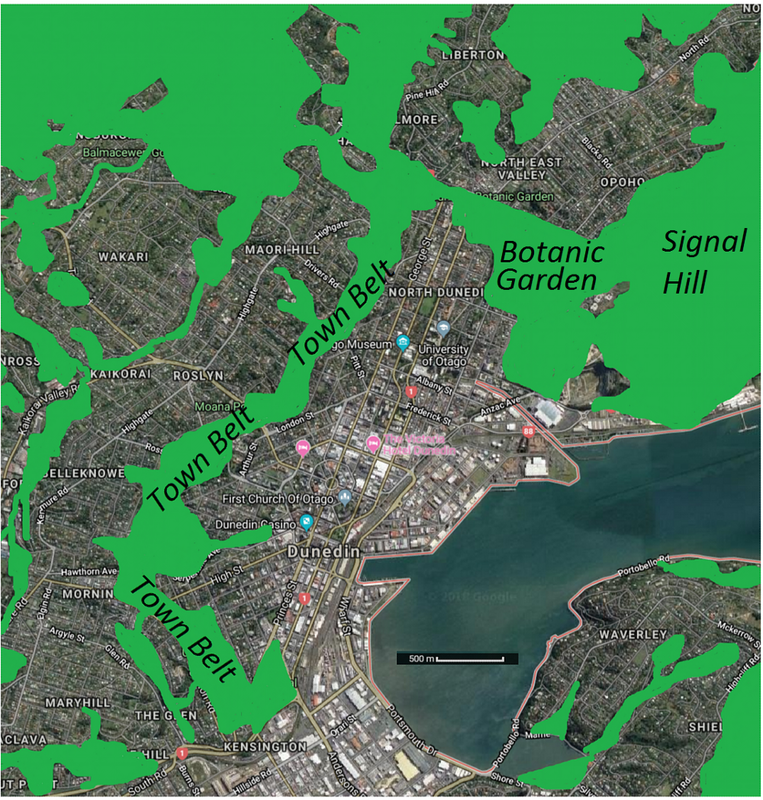 Perhaps the most notable town planning feature of Dunedin is a belt of greenery around the inner part of the city called the Town Belt. Approximate extent of parks and gardens in the central area of Dunedin, marked in green.The First Church of Otago is on Moray Place (see below). Background imagery ©2019 CNES, Airbus, DigitalGlobe, Landsat/Copernicus. Background map data ©2019 Google. North at top. Another product of Dunedin’s early planning is a precinct called the Octagon, bounded by an octagonal street called Moray Place. The Octagon and the streets that radiate out from it dominate downtown Dunedin. The Octagon gives the city a bit of a Parisian quality, though it is actually modeled on the Moray Estate in the New Town of Edinburgh. The Octagon in 1949, showing Moray Place around the outside. This image is clickable and zoomable at very high resolution. Source: Dunedin. Whites Aviation Ltd: Photographs. Ref:WA-23421-G. 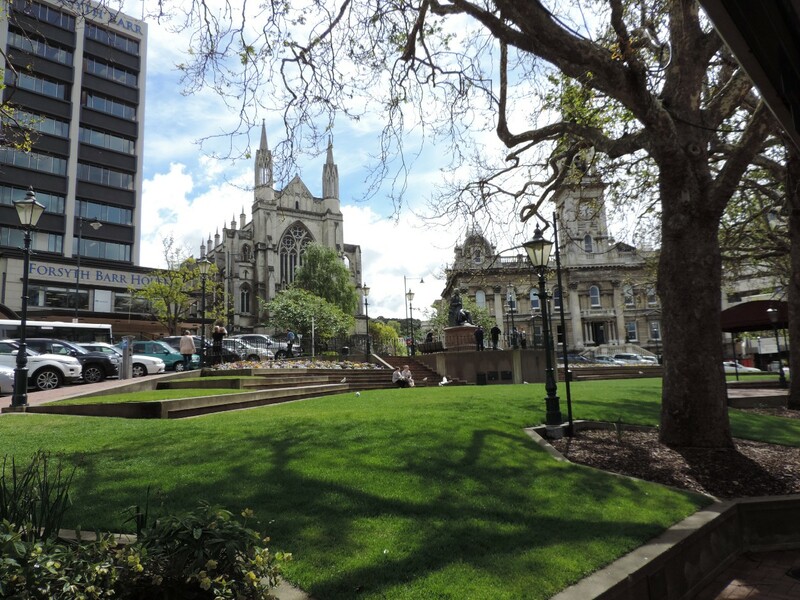 The triangular tree-lined park at top centre, with a prominent whitecenotaph, is called Queen’s Gardens, and it is next to the First Church of Otago, which has a single spire. Alexander Turnbull Library, Wellington,New Zealand. http://natlib.govt.nz/records/22760905. The Octagon also resembles Dizengoff Square in Tel Aviv, though the Octagon is much older, dating back to the mid-1800s. So perhaps we should say that Dizengoff Square resembles the Octagon. Inside the Octagon today. The two older buildings are St Paul’s Anglican Cathedral on the centre left and the Old Town Hall in centre right. 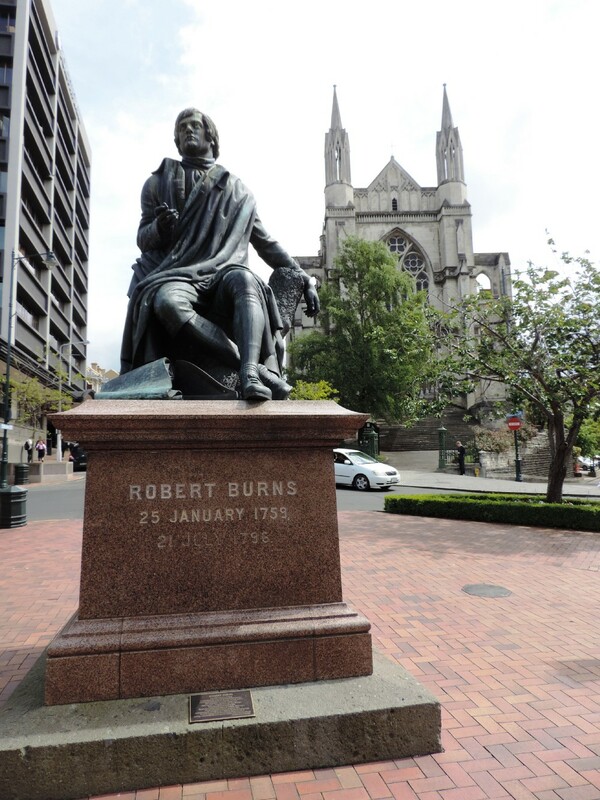 In the middle of this photograph, in front of the extreme left of the Old Town Hall, there is a statue of the Scottish poet Robert Burns on a raised plinth. 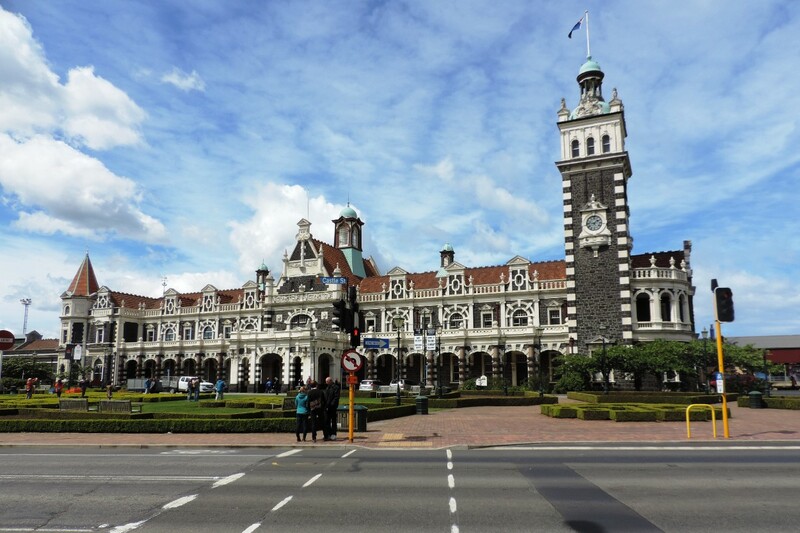 Dunedin was the most important city in New Zealand in the late nineteenth century. 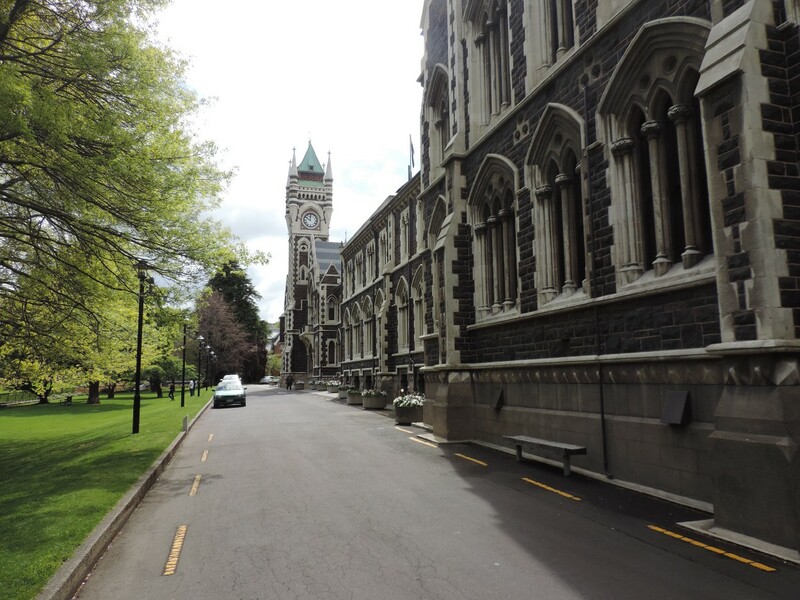 New Zealand’s first university, the University of Otago, established in 1869, is located north of the Octagon. Otago University was set up on Scottish lines, with day students rather than residential students, the norm in England at the time. The regional name Otago comes from a southern Māori dialect and would be rendered as Ōtākou in standard Māori, which is mostly based on North Island dialects. South Island Māori were always few in number compared to those of the North Island, and were diminished and scattered further in the early days of colonisation, which included raids and internal colonisation by North Island Māori groups in a context of general disturbance caused by the coming of the European and the introduction of firearms. The largest and most coherent South Island Iwi (or Māori tribe) today is the Ngāi Tahu, itself of North Island origin, which has absorbed some smaller South Island peoples such as the Waitaha. As a result of all this upheaval the exact meaning of Otago / Ōtākou is no longer known, though it might mean ‘isolated village’ or ‘place of red earth’. Dunedin is known as in Māori as Ōtepoti, the name of an old Māori settlement located on the site of the later urban downtown. Ōtepoti is supposed to have been abandoned by the time the first Scottish settlers turned up to found Dunedin in the 1840s. The name New Edinburgh was initially favoured for the settler town. However, the prominent Scottish writer and publisher William Chamberssuggested that “ the ancient Celtic appellation of Edinburgh” be applied instead. Officially, some places in New Zealand have both Māori and settler names, and some have Māori names only. But the only official name for Dunedin is the one bestowed by Chambers. 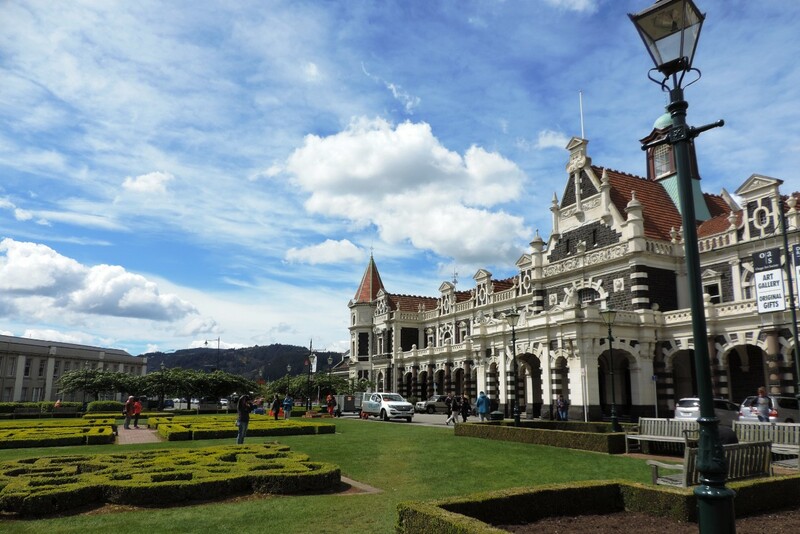 Although there is a strong Scottish influence in New Zealand generally, Dunedin and Otago are the most self-consciously Scottish parts of the country, and indeed perhaps anywhere outside of Nova Scotia and Scotland itself. 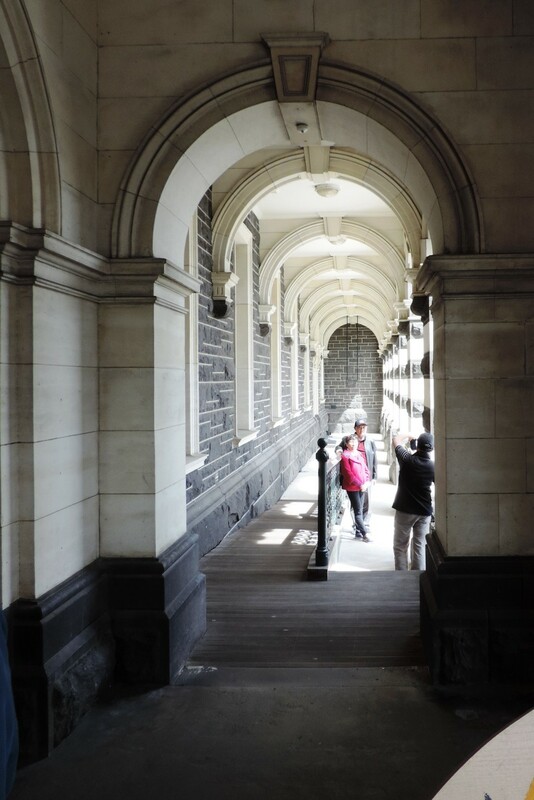 In addition to Scottish and Māori influences, there were also strong Chinese influences in the development of Otago, with some five thousand Chinese people working in Otago’s goldfields at one time in the mid-to-late nineteenth century. The Chinese legacy has led to the creation of a traditional Chinese scholar’s garden next to the Toitū Otago Settlers Museum in downtown Dunedin, which I will write about in my next post. There were also some connections, though generally more indirect, with India. Dad grew up in Dundee and lived in New Zealand since the late 1950s, but amazingly, he’d never been to Dunedin till Chris showed him around in October 2017. 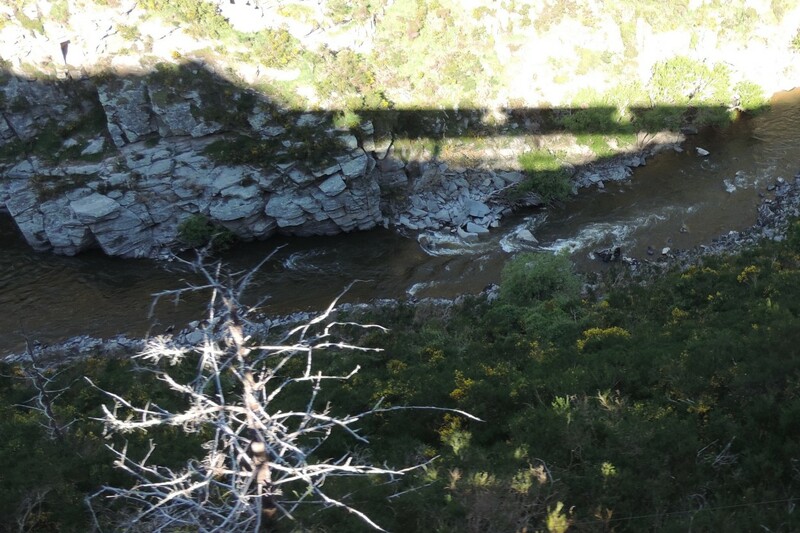 The rest of this post concerns the trip that dad and Chris made on the Taieri Gorge Railway, which runs from Dunedin to the inland town of Middlemarch and back. Between Dunedin and North Taieri, at the foot of the Taieri Gorge, the train runs on the Taieri Plain. This is a low-lying, sea-level plain through which the Taieri River meanders on its way to the sea after emerging from the Taieri Gorge. Indeed some parts of the Taieri Plain are below sea level, having been were reclaimed from swamp in the early days of colonisation, Netherlands-style. The Taieri Plain supplied the early city with its crops and other foodstuffs. 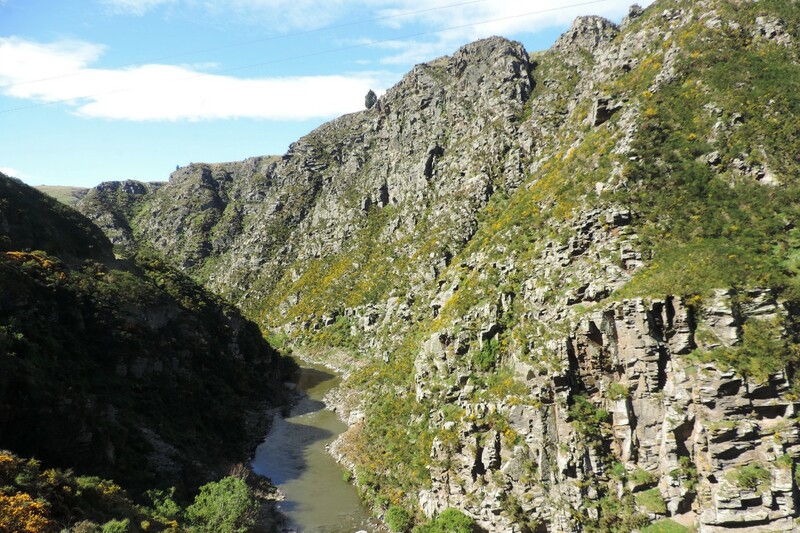 The railway was built up the scenic but difficult Taieri Gorge, in order to open up a plateau called the Maniototo and other parts of Central and North Otago to commercial agriculture. Maniototo means ‘plain of blood’, a reference to the red tussock that used to cover most of the high plain. 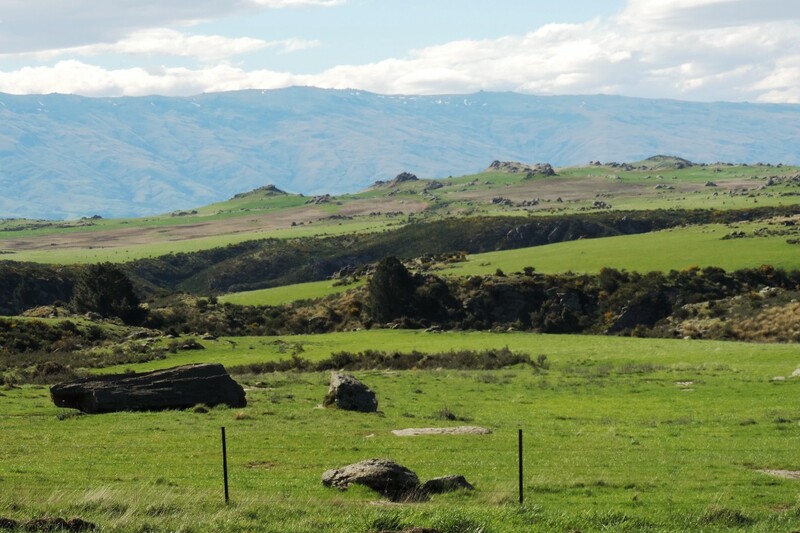 The Maniototo is less fertile and arable than the Taieri Plain, which is a little patch of Holland in an otherwise rugged landscape. And Central and North Otago are close to being actual deserts. On the other hand, the regions made accessible by the Taieri Gorge railway are, altogether, much larger than the comparatively tiny Taieri Plain. The railway was built in stages from the 1870s onwards, from Dunedin to the inland town of Cromwell east of Queenstown, where it connected to a railway that led to Kinloch on Lake Wakatipu. 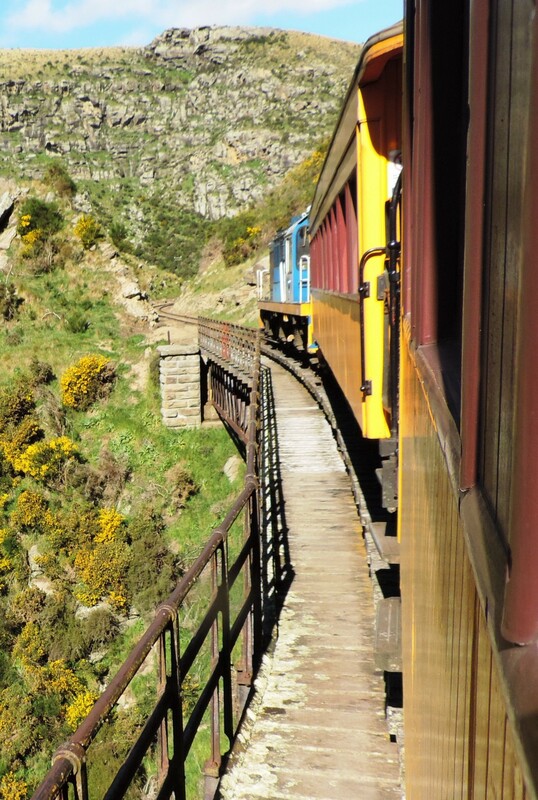 Later on, the railway was closed in stages, leaving only the stretch between Middlemarch and Dunedin to be used for excursion trains up the scenic Taieri Gorge. On this trip, Chris and my dad went as far as Pukerangi, where the train first comes out of the gorge onto the Maniototo. This was a four hour return journey from Dunedin. Middlemarch is quite a bit further on, a six hour return journey from Dunedin. You have the option of either. 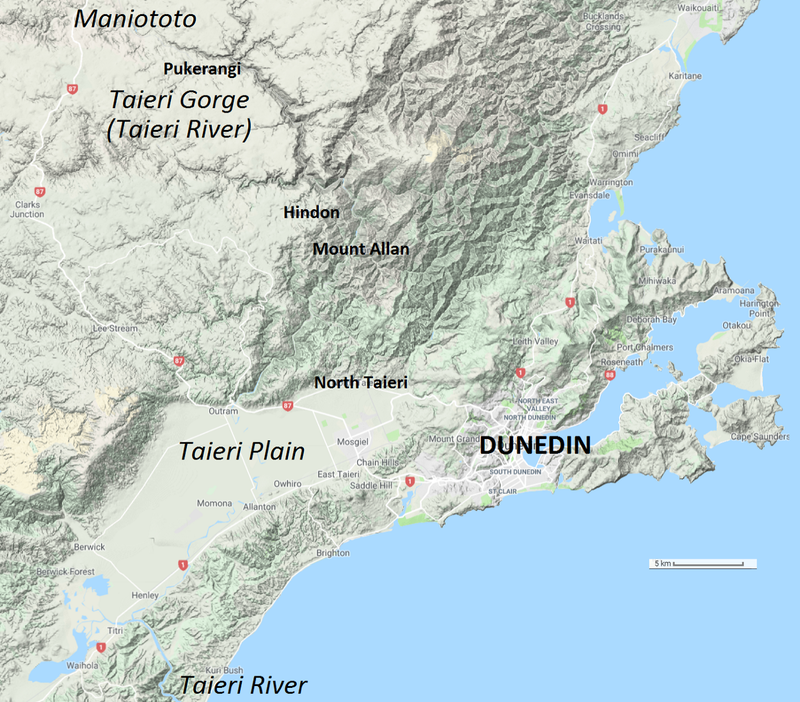 Map of Dunedin’s environs with key locations relevant to the Taieri Gorge rail excursion. Background map data © 2019 Google. North at top. 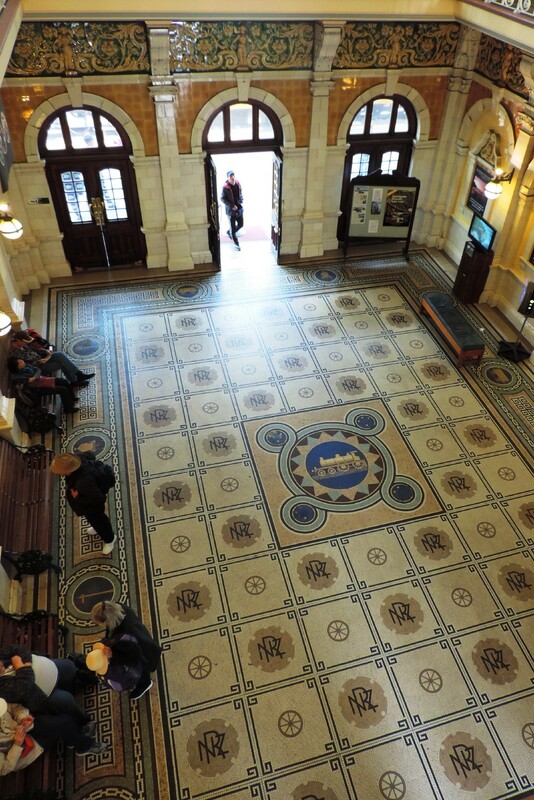 Here are some pictures of Dunedin’s railway station, which Chris and dad left from to go up the Gorge. 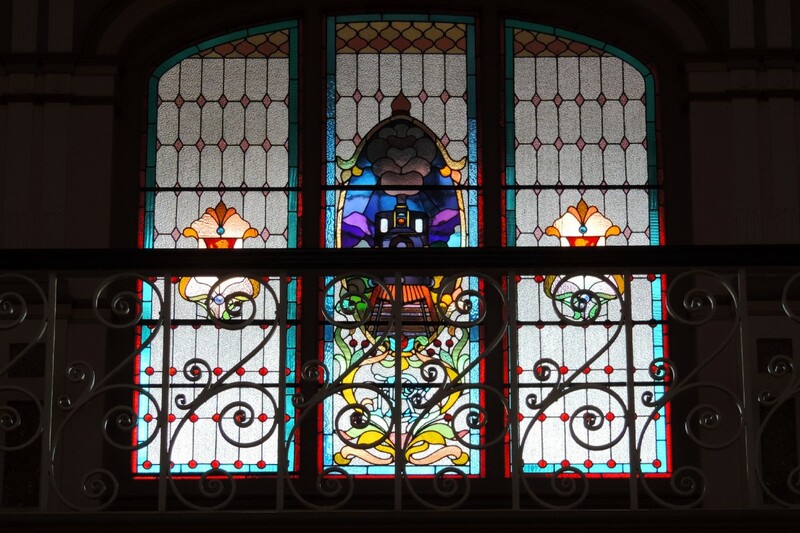 A really impressive railway station with stained glass windows — a cathedral of steam, as they say — was opened in 1912. 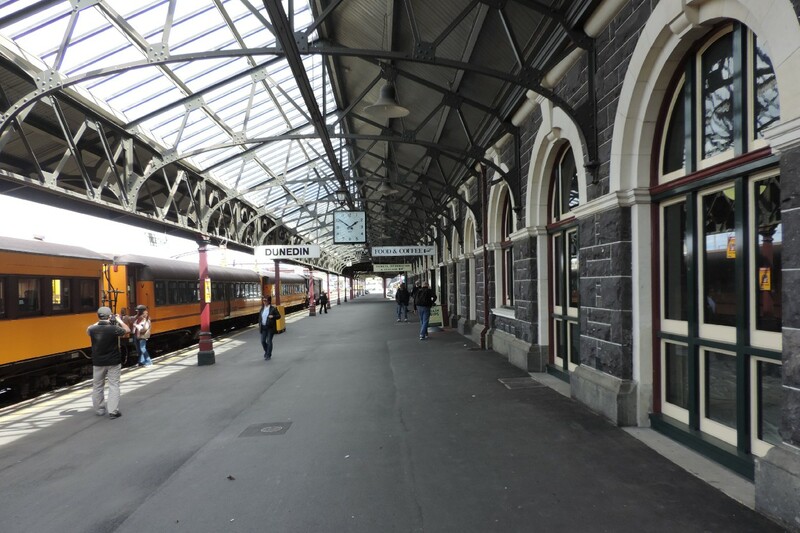 The journey begins by travelling through the Southern parts of Dunedin city, before the train turns onto the Taieri branch. From here the train meanders across the beautiful Taieri Plains before climbing into the Gorge, a narrow and deep ravine carved out by the ancient Taieri River. 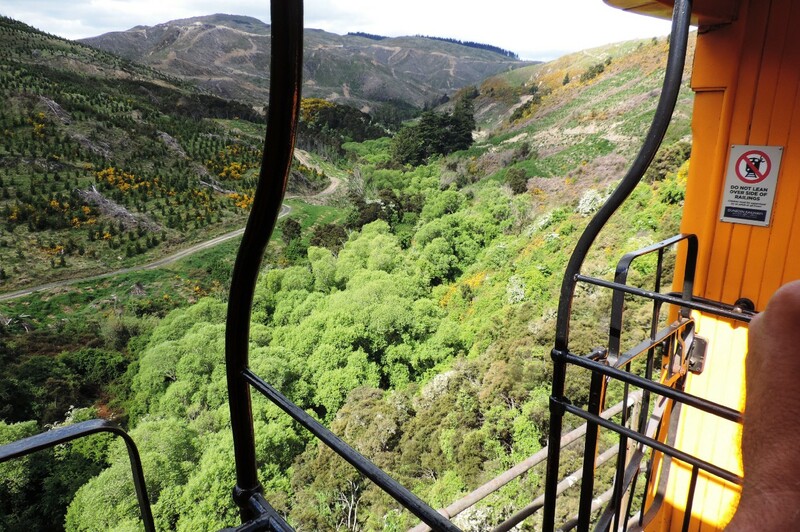 Negotiating the gorge with ease, the train travels through ten tunnels, across numerous bridges including the famous Wingatui Viaduct — the second largest wrought iron structure in operation in the world. This is a fascinating excursion into some of New Zealand’s most iconic scenery and history, where you will be amazed at natural beauty combined with the engineering feats of New Zealand’s early pioneers. 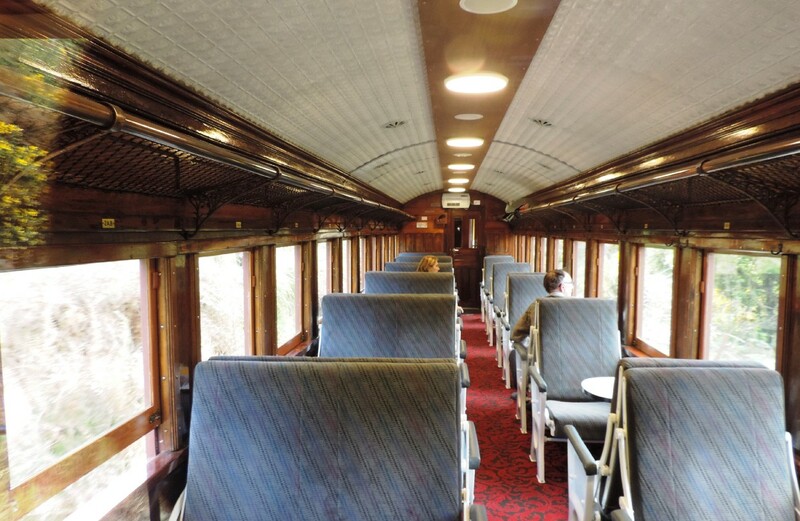 The open air platforms of the carriages provide the perfect photo opportunity, or you can enjoy a quiet drink in our on-board café, while the train manager shares fascinating, lively stories about the environment and history of New Zealand’s gold rush era. 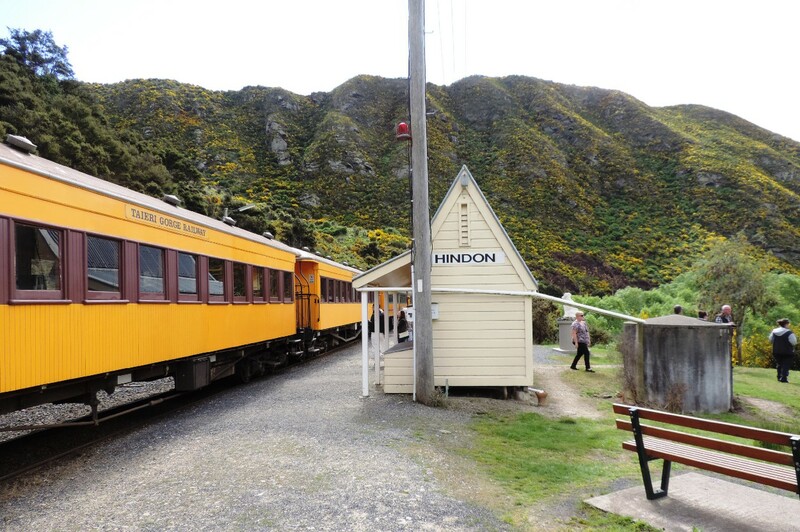 Hindon, a stop on the scenic excursion. There used to be a town here. This is what the train is like inside. They serve all kinds of food and drink, so you aren’t roughing it! The upper Taieri Gorge is incredibly barren and full of endlessly fascinating rock formations that go by. 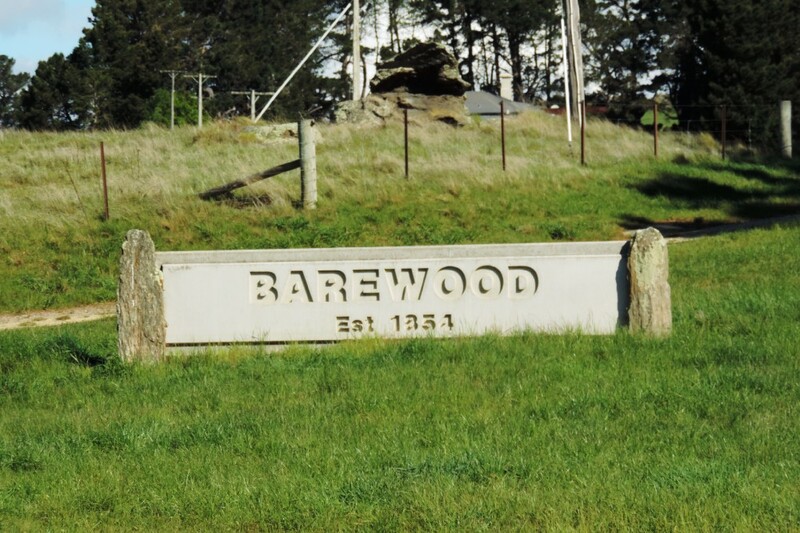 At Pukerangi, there’s a farm there called Barewood that dates back to 1854. It’s a fairly treeless sort of an area, with strange and bizarre rock formations poking through what are now grassy sheep-paddocks. The only trees of any great size in the area seem to be ones introduced by the farmers such as the Monterey Cypress, cupressus macrocarpa, planted to create windbreaks and as a source of firewood: a species widespread on New Zealand farms and known throughout the country simply as ‘macrocarpa’. Other parts of Otago’s interior are still covered in the original red tussock. The wilder parts of the Maniototo and North and Central Otago feature in many scenes in Peter Jackson’s Lord of the Rings and Hobbit movies, such as the Plains of Rohan. It’s possible to carry on from Middlemarch via the Otago Rail Trail, a cycle track that follows the disused railway. Or, you can drive the route by car along State Highways 87, 85 and 6 to Queenstown. There are several picturesque old towns and localities along the Otago Rail Trail and in neighbouring districts, some little more than a country pub these days while others are larger, but none particularly large. These townships date back to the 1860s and 1870s and often have quite historic and picturesque buildings made of stone in view of the shortage of local timber. The townships were all sustained at one time by gold and sheep, and kept going nowadays by tourism, including thirsty rail trail cyclists! My next post on Dunedin will feature a discussion of Dunedin rock bands, the dwindling yellow-eyed penguin, the Chinese scholar’s garden and Larnach’s Castle, a Victorian folly erected by the businessman and politician William Larnach. Note: The quote about Dunedin in 1881 is from Kenneth B. Cumberland and R [Raymond] P. Hargreaves, ‘Middle Island Ascendant: New Zealand in 1881’, Part Two, New Zealand Geographer, Vol. 12, №1, 1956, pp. 51–74, at p. 69.